Somewhere around St. Petersburg and W. Somerset Maugham, it became clear that The Dead Ladies Project isn’t to be shoehorned into any of the recognisable classifications that exist for contemporary memoirs. Superficially, The Dead Ladies Project is a meandering meditation about a Grand Journey wandering in the landscape of literary, some by association, women (and a few men) who are either unappreciated or little known. Each chapter is built around an excursion and mines the life of Crispin’s ‘dead ladies,’ some that she admires unreservedly, like Claude Cahun, and others, like Rebecca West and Jean Rhys, with whom she lovingly dissents. Each of the chapters is beautifully executed. On each of three readings I picked a different favourite journey, though I suspect the Nora Barnacle chapter is the one will bewitch me for longest. Or the Maugham. Or the Rebecca West. But Crispin is more unique among contemporary travel writers and memoirists for her courage in using The Dead Ladies Project as a backdrop to engage with the core existential questions of how to live in a sociopolitical (perhaps I should say biopolitical) system that subsumes all sexual, sensual and social experience. Crispin wrestles with two familiar extremes, that of enjoying the freedom of libidinal hedonism, contrasted with withdrawal into monadic seclusion. What is distinctive to Crispin in The Dead Ladies Project, compared to a writer like Houellebecq that travels down similar roads, is that despite the despair and dark humour, there is optimism. How rare to come across an imagination fresh and rich enough to shift our vision, even by a small degree, on the society that is coming into view. I think she’s the best novelist now  writing, not always, but I think The Middling is a magnificent novel. And A Source of Embarrassment, about the woman who knew she was going to die. This last book, The Heavy Feather, is so good I can’t believe it, and nobody likes it. And they are wrong. I am exaggerating, of course. Lots of people do admire her, but not enough. Rebecca West was not Barker’s only advocate. Auberon Waugh said, “I know nothing of A. L. Barker, except that she writes like an angel and I love her.” West called Barker’s The Middling, “…the finest book written by a woman in our time, and if the critics don’t think it is, that is their fault, not hers”. For reasons I cannot recall I started my Barker journey not with The Middling, but A Source of Embarrassment. The story is not what I expected after reading the opening pages, it is more dark, more twisted. Opening with a ladies’ tea party, I thought it is unlikely I’ll be finishing this book. The elaborate tea party is a clever device, the bitchy ladies that sit around gossipping about Edith Trembath exist merely to provide a counterpoint, some depth to a potent and memorable character. The story is advanced through dialogue, which Barker handles with mastery, as she does the nuances and alternating currents of a relationship. You get the sense of a careful writer, choosing words with great care and precision. It is an odd story, but worthwhile, maybe not Barker’s finest but sufficient impetus to read more deeply of an under-appreciated writer. Faber Finds, an imprint aimed at restoring the works of “authors of distinction” now offers Barker’s oeuvre. He was a truly original writer, his prose was fresh minted, he drove his bloodless scalpel inches deeper into the brain and heart, none of it had been said before. He is nearly forgotten. Now I admire Muriel Spark, for she is an innovator. And I am a fanatical admirer of A. L. Barker. If you cannot read her it is your fault. You should ask your vet to put you down if you do not admire The Middling or An Occasion for Embarrassment. I admire the grand architectural force of Paul Scott, and the subtlety of Francis King, notably his book The Widow. Don’t You Loathe Comedic Writing? No genre makes my skin crawl more than comedic writing. I don’t mean those puerile books like The More I See of Men the More I Love My Dog…. that congregate by the tills in bookshops, impulse purchases for people that wandered into the shop thinking it was the next door tanning salon. My disdain is for the humorists, sometimes camouflaged as satirists, that lay the humour with a bricklayer’s trowel. In this category, this side of the Atlantic, are writers like Tom Sharpe, Douglas Adams, Ben Elton, Stephen Fry; on the other side are Carl Hiaasen, Dave Eggers and P. J. O’Rourke. Is it coincidental that this genre is an all-male pursuit? He accepted the post quite innocently, without any attempt to deceive, because she had told him she was a member of the Plymouth Brethren, and he imagined that this was a small revolutionary body. When he discovered the truth he behaved with great correctness. He said nothing. He liked my grandmother, he liked her sons, and he thought he could teach them better than the next man, and he made it a rule never to recommend to them any idea of which their mother might disapprove; and there was forged a bond between them which never broke. My father used to tell the story with a chuckle, which became to me the sign of his appreciation of the random nature of human life, and the queer ways human beings counter it and impose a kind of order. Out of bigotry my grandmother had engaged the best possible kind of tutor for her sons, in fact the tutor most likely to prevent them growing up bigots themselves. In the multitude of ways a writer could have chosen to tell this story, West does so with wit, elegance and percipience. The essay itself is superb, dealing with West’s conviction to become a writer, and how she discovered her voice. West’s humour announces itself on every page, but is satisfied with a gentle smile. I had planned to skip Rebecca West’s ‘Why my Mother was Frightened of Cats.’ Essays about mothers are normally too mawkish; combine mothers and cats and nausea is inevitable. The brilliance and humour of the three previous essays from The Essential Rebecca West carried me forward to, “He [Lord Roberts] would turn and run if a cat walked towards him on the parade-ground; and I quite realised that if Lord Roberts could not control this terror my mother could not be expected to do better. So there was no ill-feeling between us.’ Without shame or embarrassment, I admit I finished this essay about mothers and cats. It is a first. Geoff Dyer shoved me toward West, with the gentle encouragement of Emily at Evening All Afternoon and pages turned. 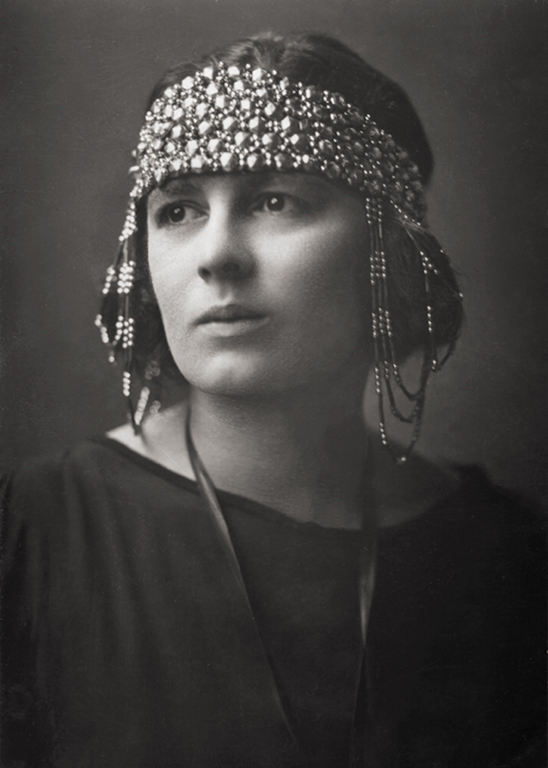 Rebecca West, as photographed by ‘Edwardian Modernist’ photographer E.O. Hoppé. West donned the head-dress to conceal wet hair. The exhibition, open today, at the Portrait Gallery is superb, and includes portraits of many literary artists. I’ve long been intimidated, though I’ve never read any of her writing, by Rebecca West. This intimidation, I suspect, is because I know that I’ll read her thousand page plus masterpiece Black Lamb and Grey Falcon, but am nervous of the scale of the task. I am delighted to come across a less daunting progression for newbies to West,’ which feels like a plan. Somehow I’ll weave this plan into my parallel plans to read all Kafka, a lot more Duras, all Nabokov and Bellow.